Fossil's stock took a beating Tuesday, making it the second-worst performer on the S&P 500 (SPX) and Nasdaq (COMP), after the company reported weak revenue and cut back its sales outlook for the current quarter. Fossil (FOSL) reported third-quarter sales of $684.2 million, falling short of the $713.1 million analysts had expected. Earnings fared better. Fossil beat earnings-per-share forecasts by 9 cents. But Europe, once again, reared its ugly head and took a big bite out of the company's sales. A stronger U.S. dollar was also to blame for the sales shortfall, which Fossil said resulted in a decrease of $22.2 million in overall third-quarter sales. One bright spot remains Asia, where sales rose nearly 27%. Still, that wasn't enough to keep investors and StockTwits traders from weighing in. Wholesale sales were barely higher so if Fossil can make it up with foot traffic to its stores then there is room to turn things around before year-end. 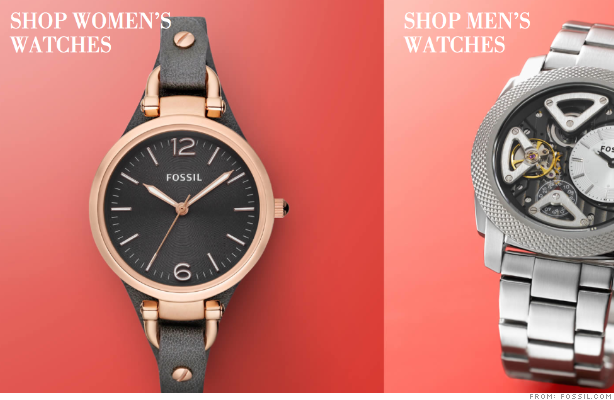 And even though the company trimmed back its sales forecast, Fossil still expects a 12% increase in the fourth quarter. That's not too shabby. bradloncar: $FOSL makes a quality product for a good price. Not the type of company I'd want to short regardless of an earnings report or two. That might be a very good point. Just six months ago, Fossil's stock sank nearly 40% for the exact same reason: Europe. But fast forward to August, when the stock rallied 30% on a strong earnings report. But not everyone was sold on Fossil's ability to turn things around. Berserker $FOSL When is the last time you saw a fossil commercial? 1996??? Fossil has made some notable acquisitions and shouldn't be written off just yet. Earlier this year, Fossil acquired Skagen, which makes watches and other accessories. And the company has had a long-standing relationship with Michael Kors (KORS), DKNY, Armani and others. Shares of Kors edged down a little more than 1%. It's not that much of a surprise that Europe would be having an impact. They are, after all, struggling to pull themselves out of a debt crisis.Fossil rivals Coach (COH) and Guess (GES) have also both been cautious about the near term, given those headwinds.